The Kinesio Taping ® Method has taken the rehabilitation and sports medicine world by storm. This amazing taping method was developed by Dr. Kenzo Kase over 25 years ago in Japan. Kinesio Taping® has quickly become the gold, or should we say “platinum” standard, for therapeutic rehabilitative taping. The proprietary method of taping uses a uniquely designed and patented tape for treatment of muscular disorders and lymphedema reduction. The second technique, which is most commonly used in the acute stage of rehabilitation, helps prevent overuse or over-contraction and helps provide facilitation of lymph flow for an entire 24 hour period. Correctional techniques include mechanical, lymphatic, ligament/tendon, fascia, space and functional. Kinesio® Tex tape can be used in conjunction with other therapies, including cryotherapy, hydrotherapy, massage therapy, and electrical stimulation. Kinesio Taping® affects the activation of the neurological system, the body’s information processor and the circulatory system. Muscles are not only attributed to the movements of the body, but they also control the circulation of venous and lymph flows, body temperature, etc. Therefore, the failure of the muscles to function properly induces various kinds of symptoms. Consequently, more attention was given to the importance of muscle function, that the idea of treating the muscles in order to activate the body’s own healing process came about. Using an elastic tape, such as Kinesio ® Tex tape, it was discovered that muscles and other tissues could be helped by outside assistance. 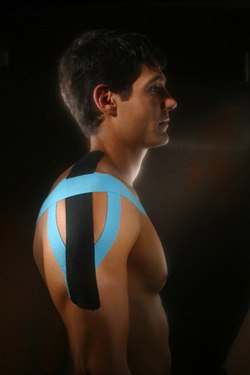 Employment of Kinesio Taping ® creates a completely new and innovative approach to treating nerves, muscles and organs. Since the introduction of Kinesio Taping ® into the US, medical practitioners from PTs, ATCs, OTs, DCs, MTs, to MDs have recognized and embraced this effective, safe and best of all, easy-to-use modality. The method and tape allow the individual to receive the therapeutic benefits 24 hours per day with both comfort and ease, because it can be worn for several days per application. Currently, Kinesio Taping ® is used in hospitals, clinics, high schools and by professional sports teams. There are two ways to apply Kinesio ® Tex tape. You can apply the tape with little to no stretch, which is described as UN-STRETCHED, or you can apply the tape while it is stretched, which is known as STRETCHED. UN-STRETCHED: In this case, we stretch the skin of the affected area before application of the tape. This is done by stretching the muscles and joints in the affected area. After application, the taped skin will form convolutions when the skin and muscles contract back to their normal position. When the skin is lifted by this technique, the flow of blood and lymphatic fluid beneath the skin improves. On the other hand, if joints or ligaments are injured, the tape should be STRETCHED before application to the skin. The damaged joints or ligaments are incapable of functioning normally and rely on the stretched tape for correction. It is also important to note that while depending on the injury, tape is either stretched or not stretched, this does not mean that the actual application technique will change. To ensure that the muscles have free range of motion, elastic tapes with an elasticity of 130-140% of its original length are recommended for Kinesio Taping®. This specific elasticity also will not allow an over stretch of the muscles themselves. It may look like conventional athletic tape, but tape and Kinesio Taping ® is fundamentally different. Kinesio Taping® is based on a different philosophy that aims to give free range of motion in order to allow the body’s muscular system to heal itself bio-mechanically. Muscles constantly extend and contract within a normal range, however, when muscles over-extend or over contract, such as when lifting an excessive amount of weight, muscles can not recover and become inflamed. When a muscle is inflamed, swollen or stiff due to fatigue, the space between the skin and muscle is compressed, resulting in constriction to the flow of lymphatic fluid. This compression also applies pressure to the pain receptors beneath the skin, which in turn communicates “discomfort signals” to the brain and emdash, thus the person experiences pain. This type of pain is known as myalgia, or muscular pain. Tape can be applied as a single strip [I], or in the shapes of an “X” or “Y”, depending on the shape and size of the targeted muscle(s). The basic principle of therapeutic taping for weakened muscle is to wrap the tape around the affected muscle. Start from where the muscle begins [ORIGIN] and continue along the muscle, and finish where the muscle ends [INSERTION]. This particular application process is typically used for supportive purposes. As the muscle fibers contract, Kinesio ® Tex Tape supports the contraction by pulling and stimulating the skin and muscle back towards the point of origin. For preventing cramping or over-contraction (overuse of muscles), tape should be applied from [INSERTION] to [ORIGIN]. If you are treating yourself without assistance, it is important to remember the basic principle of stretching the skin before application, no matter where the pain is located. For example, if the body-side of the forearm is the source of the pain, you should bend your hand back before applying the tape. Similarly, if the source of pain is the outside of the forearm, then the wrist should be bent forward. This principle must be strictly observed. For treatment of muscle pain, Kinesio Taping ® is ineffective unless the skin is stretched. This particular application process is typically used for acute conditions such as strain or sprain, muscle spasm, and edema from injury or surgical procedures. As the muscle fibers contract, the Kinesio ® Tex Tape will relax or slack said muscle. To learn more about the Kinesio Taping® method you can go to the official association site. Contact us today to find out if Kinesio Taping® can help you.